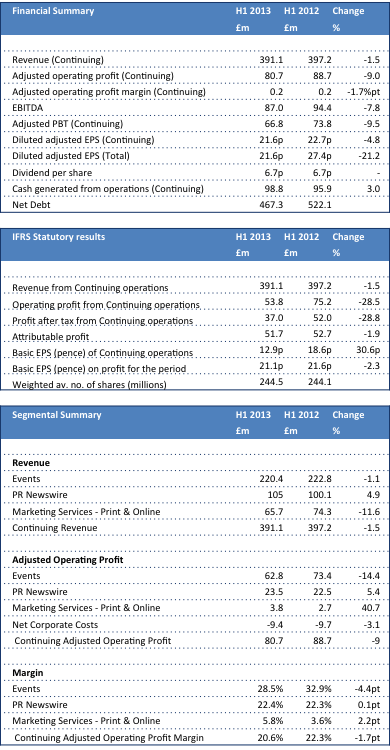 UBM have reported a decline in profits for the first six months to 30th June 2013, largely reflecting a tough first quarter, lower biennial contribution and continuing investments in their events portfolio. “As highlighted at the IMS in April, challenging market conditions, particularly in the UK construction sector, meant we had a tough first quarter. A good second quarter substantially offset the Q1 performance, thanks in large part to healthy growth at our shows in China. With continued strong forward booking trends for our H2 Emerging Markets events we feel confident about the second half. “During the first half we completed the Delta disposal and accelerated the restructuring of Marketing Services. We are aligning Marketing Services more closely with our events and focusing it on more profitable, community-based business models which take advantage of our strengths in high quality content and audience reach. We’re already seeing improved profitability, albeit on lower revenues. We expect this restructuring programme to be substantially complete by the end of the year.